I got giddy with excitement yesterday, sniffing around Oxford Circus in search of a few sale bargains for my forthcoming beach holiday. The new AW10/11 collections are go, and were they ever up my street (that’s rhetorical, like). In Topshop, its all about Goth. Maxi dresses are still a la mode but with a seasonal, Twilight-esque edge. Am loving Kate Moss’ embroidered tulle (although I can’t quite fathom the occasion) and the embellished snow queen maxi is splendiferous (wedding? Dinner party? Morrisons?). The Holly floral defies explanation. There are also corsets aplenty (worn over stuff this season, don’tcha know). There’s the grey marl, the vintage lace and the caged corset – and they’re just for starters. 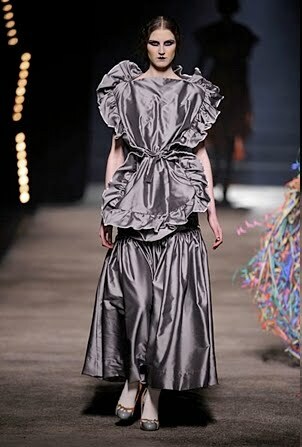 Then there’s plain ol’ over-the-top theatrical, madness; ruffles, flowers and, frankly, embarrassing bow necks. I, for one, am daft enough to sport the floral tie neck blouse, tail bandeau dress, floral cord shorts, and leopard Peter Pan collar dress. Never Never Land indeed (our Viv would approve, see pic on right, as would Oscar de la Renta, eyes up and left). In Miss Selfridge, there’s lots more Gothiness – and loads of cream, and black – and cream and black. Then there’s the new florals – less summer meadow and more rose-led drama-rama. Check the red rose cocktail dress, printed tea dress, rose printed border dress and trailing rose maxi. All Saints are the kings of Goth anyway, so key pieces from them this season are a must. Clobber the credit card with this sheepskin jacket (hubba hubba), Nirvana dress, nyx kaftan and brocade military tailcoat (it’s like Laddie from The Lost Boys all over again). Anything that involves the word ‘Victoriana’ gets me (one day I’ll tell you the story of Victoriana – my thermal, lace-collared nightdress – the husband cussed her so bad that the poor darling was sent to an early grave) and this lace top from Oasis will have to be purchased on that basis alone. As will this AMAZING jacket (must have it, must have it, must have it – perhaps him indoors can buy it me to make up for the nightdress he verbally tortured?). For more ruffle-lace-and-frill-tastic fun there’s the spot devoire blouse, indigo silk ruffle bandeau, ruffle bib shirt and bloody gorgeous red ruffle funnel mac. With all these hot jackets on offer I can sense that my coat rail is going to fall off the wall. Again. I loved Mango’s summer collection and their autumn stuff is just as lush, bright and beautiful. Loving the ethnic dress, retro belted dress, Nancy dress and super duper African tunic. Last but not least, let’s go to Warehouse, where the floral jumpsuit reigns supreme (and pattern shawl collar cardi ain’t bad neither). Roll on the falling leaves. Well, kinda. By the way, this post is dedicated to a certain Ms P Carswell – you can step away from that catalogue now, right? You are amazing and so are these clothes. Thank you, madam. Catalogue duly placed in recycling. Morrisons! We should all dress up more when going to Morrisons. Very Nice Goth dress your collection is very nice.I like these designs too. Wow, this is beautiful !